These flies are invented in Siberia long ago. Probably they were already used in the 19 century. The idea of combining a fly and tiny jig is rather logical. The center of their origin should be the area around the Lake Baikal. In any case, namely here there is the largest diversity of the lures of this kind. The best Internet resource on these flies is here: http://www.markov.baikal.ru/ The Hollow Head flies have several important advantages comparing with the common goldheads — flies tied with a metal bead at the head. First of all, instead of a round bead you can prepare the soldered head of any shape; this allows much better imitation of a larva or scud. The direction of the hole forces the fly to hang at about a 90 degree angle to the tippet. This is minimizing the number of snags and lost flies; it is easier to drag the fly on the bottom with less risk of loosing it. The Holey Head fly is tied to the hook not the way you do it with regular nymphs. Thread the tippet into the hole from the inside and tie it to the head of the fly. ! [ You will need a limited selection of tools and materials The local fishermen of the Far East are using such flies for long time. Most often they are fished with a long pole and bobber (drift-fishing in the current) for Amur grayling and lenok. The idea of the goldhead nymphs or of flyfishing itself had come to the Khabarovsk area not long ago. 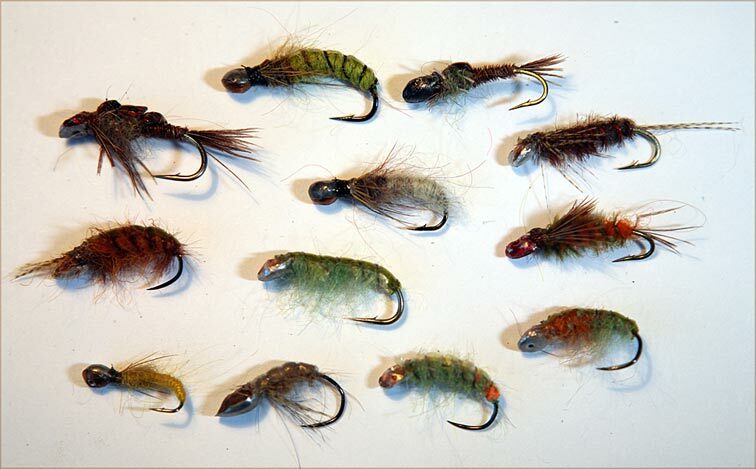 Most of the local Holey Head flies imitate scud; they are made on the «humpy» curved hooks with a self-made metal head. The soldering is much easier if you have a simple tool — a needle made of titanium. A self made needle of stainless steel is working fine as well. It is possible to use a point of a sewing needle in a piece of wood. This needle should be rubbed with soft graphite pensile, so the melted tin (lead) will not stick to it. As a rule, I make these flies with a head shell of copper; lenok and grayling are always fond of copper colors in your flies. The shells of the fly heads are pressed out of a sheet of copper foil with any round object of necessary size (point-tool) on the piece of lead. Use the scissors and cut the shells out The ready shells are put on a wooden mandrel of the same shape as the point-tool. Use a thick needle to make a hole in the middle of each shell. Do not punch the holes from the inside — the rough edges will damage the ltippet. The shell is put on the titanium needle, and then the same needle goes through the hook eye. Put a drop of soldering acid into the shell. 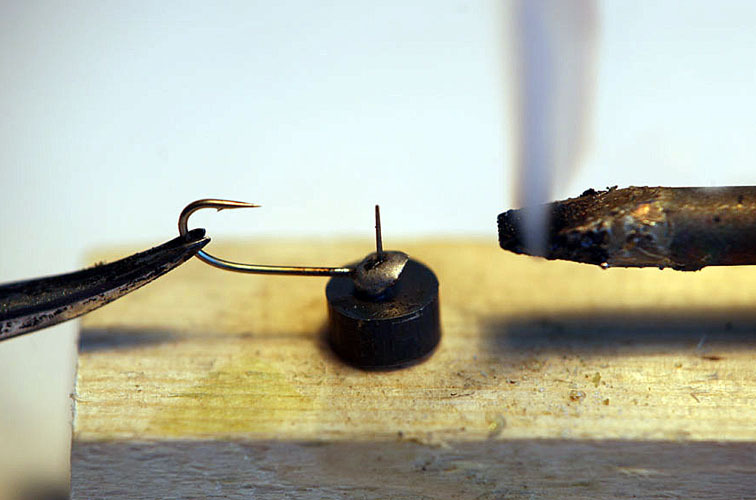 Fill the shell with tin or with tin-lead alloy.Rinse the ready hooks in the hot water to get rid of the acid. Remove the burrs with a file. * Remove the burrs with a file. Polish the copper head with a needle and felt, and cover it with clear waterproof varnish. The holey Head flies are tied exactly the same way as the goldhead flies. I wish you best success on your next grayling fishing!